Could your project use a dose of Eco Drama? Eco Drama is a Glasgow based Children’s Theatre Company that engages and inspires young people in the value of caring & being responsible for our natural world. 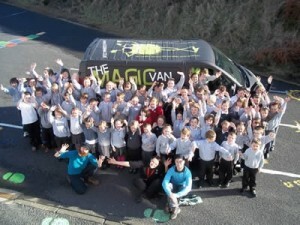 Over the last 5 years, as well as leading their own CCF project, Eco Drama has been in high demand among schools, community trusts, theatres and CCF groups who are looking for creative and innovative ways of engaging their communities, in particular their young people, with carbon reduction and carbon literacy. In fact over 25 CCF communities have engaged with Eco Drama, reaching more than 6000 young people across Scotland. By harnessing the power of drama and involving young people emotionally in their learning, Eco Drama aims to increase carbon literacy and reduce carbon emissions through inspired, positive behaviour change. Eco Drama believes that they can assist other groups and communities in achieving their eco goals by sharing these creative tools and practices, and helping them to develop their own creative engagement strategies. In 2014 and 2015, Eco Drama has an exciting menu of workshops and shows available which address a number of Eco topics including bio-diversity, food waste, climate change, renewable energy and Reduce, Reuse, Recycle. These performances and workshops include The Worm – An Underground Adventure, The Worm Inspectors, The Oil of Life and Recycling Heroes and all come with accompanying teacher resources. Eco Drama’s work can be performed in schools, halls, at community events, festivals and theatres. Details for all of these shows and workshops can be found on Eco Drama’s website www.ecodrama.co.uk. For communities looking to engage on an even deeper level, an Eco Drama Creative Learning Practitioner can design and deliver Creative Learning CPD sessions to suit the needs of Community projects, ultimately empowering groups to use more creative community engagement methods. For example, this could involve working with volunteers to develop new ways of engaging with their community and customers on a day to day basis, developing a drama-based workshop or activities for a group to take into their local Primary schools, or it could involve developing workshops or presentation techniques that will better engage with youth in the community. The Climate Challenge Fund has recently included Eco Drama’s services as outlined above in their ‘Ideas Bank’ for groups to consider using as part of any upcoming CCF Funding Applications. Alternatively all of Eco Drama’s offerings are available to purchase individually or as part of a package from Eco Drama directly. If you would like further information about Eco Drama or the Ideas Bank please contact Sian Jones at sian@ecodrama.co.uk or by phoning 0141 552 9920. ← Previous Previous post: Where is your community at just now and where will you be by 2024?